Annex Freight Systems is considered a third party logistics company, but there may be more to consider. We combine the comfort and appeal of a small business with a far reaching nationwide network. Annex Freight Systems looks forward to hearing from you. Call, email, or submit our form online. We are excited to have you visit our site and learn more about our company and what we do. 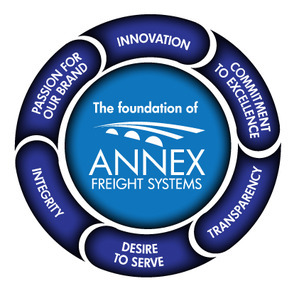 Here at Annex, we have built our business by taking the traditional freight brokerage and fusing it with a new progressive and innovative approach. The key to our business is quite simply, “A Desire to Serve.” For us, it begins and ends with our customers and our relationships. We want to get to know you and your specific needs and build a true partnership that you can rely and depend upon. We invite you to take some time to explore our site, meet our team and see if Annex might be the Transportation solution you are looking for. We update our site regularly with new tools, information, tips and industry related items and articles. So, please take a look around and see how Annex may be able to help you. We thank you for your interest in Annex and look forward to getting to know you!